Roof leaks are problematic for commercial building owners. If your property roof leaks, you may get complaints from your tenants. You must install a top-quality commercial roofing system and maintain it properly. With a wide selection of commercial roofing products today, you can be confident that there is a roof that suits the aesthetics of your building while still delivering exceptional performance as a protective shield. It’s important to know, however, that every roofing material has its own pros and cons, and certain options work best for one industry over another. With that in mind, you need to consult a professional roofing company to identify the best material options for the specific needs of your commercial building. 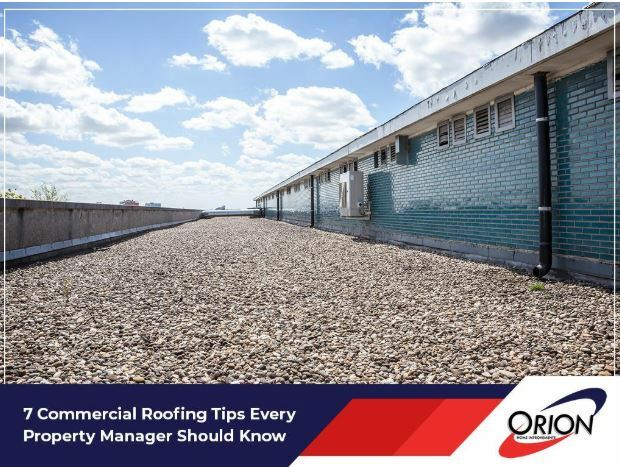 In today’s post, Orion Home Improvements gives you a detailed overview of caring for your commercial roof, along with tips to help you maximize its performance and lifespan. A commercial roof in good condition serves as your first line of defense against the harsh Virginia elements. Your roof takes quite a beating when the weather changes. As the most important part of your building’s exterior, your roof represents a huge financial investment. A lot of people practice the saying “out of sight, out of mind,” and because they don’t see and think about their roofs that much, it’s easy to forget about their commercial roofs – until they spring a leak, that is. In a state like Virginia, where severe weather is a constant concern, your roof will regularly face intense weather conditions, foot traffic and structural movement. Neglecting repair and maintenance works will eventually require you to invest in complete roof replacement. When you have a comprehensive maintenance plan in place, you can make the most of your roof’s lifespan without worries. Location – This isn’t only about your city or state where the building is located; it also includes the direction it’s facing. If your commercial building experiences plenty of sunlight or high winds, it will be affected differently than if it’s situated in a shady, arid environment. In hot climates, sealants may be particularly at risk of failing. Climate – In Virginia, heavy snow and storms can result in loose roofing tiles or shingles as well as falling trees that can impact your building’s structural integrity. In addition, humid conditions can attract mold, which can pose a health risk to your tenants or employees. Performing regular inspections is the best way to prepare for such situations. Pests – Commercial properties in rural areas are particularly susceptible to unwelcome visits from squirrels, raccoons, mice and other rodents. It’s important to seal off any spots where they can get in and deal with any problems right away. 1. Identify if you simply need repairs or if a full replacement is necessary. A roofing system undergoes major wear and tear throughout its lifetime, with factors like weathering and degeneration taking their toll. Through in-depth inspection and analysis by a professional roofing contractor, you can determine the actual condition of your roof and decide if a quick roof repair is an option or a full roof replacement should be considered. Choosing a roofer that provides both roof repairs and replacements, not just one of these options, increases the likelihood of accurate analysis and a successful plan for your roof upgrade. 2. Invest in regular roof inspections. You can never visually inspect the condition of your commercial roof enough. Hiring a professional to get up there and assess your system may be a hassle, but it is less of a hassle to spend money and effort today to have your roof last for another decade or so rather than having to continuously suffer from leaks and other extensive issues. When inspecting your roof, the roofer should look for particular warning signs, such as blocked drains, pooling water, sagging gutters, damaged fascia and soffit, missing or buckling shingles and water stains. As the leading provider of commercial roofing services in the area, we recommend having a roof inspection at least twice a year. Preventive maintenance is the key to extending the lifespan of your commercial roofing system. 3. Work with an experienced and reputable roofer. Have a leak? Who should you call to fix it? How long do you expect them to respond? These are some of the questions you might actually have when the time comes when you need to hire a roofing contractor. Without a healthy, functional roof, your commercial structure would be useless and unprofitable. What is the response time for an emergency repair? Do you have experience working with my type of roof? What products do you offer, and what brands do you represent? Can you provide references of clients you have worked with for the past years? When tackling repairs, it can be easy to say you can do it with the help of some friends. This is not the case when you’re working on something as valuable as a commercial roof. A professional will make sure your roof will receive the highest quality of work for both your building and your tenants. 4. Choose the right roofing material. Are repairs not enough to fix your roofing issues? It’s probably time to invest in a full replacement, especially if your system is 20 years old or older. Since commercial roofs are much larger than residential roofs, there isn’t much room for mistakes. To put it simply, if you opt for a wrong material or a cheaper option for your system, you might end up paying for it down the line. Before making a decision, you have to know all your options and explore their pros and cons. There are plenty of available materials today, from the standard TPO and modified bitumen to the more innovative reflective cool roof. When thinking long term, it’s smart to choose durability and weather performance over price in any equation. 5. Always listen to your roofing contractor. A roofing contractor is someone who is professionally trained and who specializes in various solutions to keep your roof healthy and reliable for years to come. That said, make sure you take their advice to heart, and take action if something needs to get fixed. In case they recommend installing a new roof, make sure you heed their recommendation as waiting is just going to cost you more down the road. 6. Know your roof warranty. Before starting the job, get every detail of it in writing, and be sure you understand completely what the warranty covers when you have a new roof installed. Just as you would with your car, keep a detailed record of all your inspections and any repairs made over time – you’ll be glad you did. 7. Don’t hesitate to ask questions. When you don’t understand a specific aspect of the job or you have concerns with the process, talk directly with your contractor about it. It’s normal to ask questions, so feel free to throw some at them during the discussion. A lot of problems during the course of a construction job is caused by a misunderstanding between the client and the contractor. These can be easily prevented by maintaining clear and open communication throughout the process. A commercial roof for your building is one of the biggest investments you will make. Implementing these handy commercial roofing tips will help make sure you get the most out of your roofing system. Tackling regular maintenance work, investing in the right products and working with a reputable contractor can help you avoid unnecessary expenses and help prolong the service life of your commercial system.